How can noticing animals make you a better person? This book shows how, even in the densest urban environments, animals have the potential to affect our relationship to the world. It posits the act of observation as an inherently ethical one. 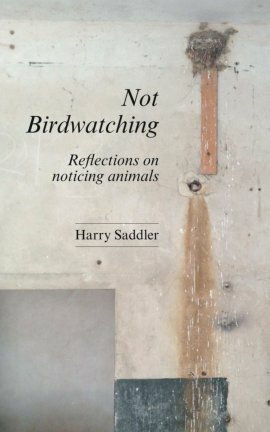 Not Birdwatching is a collection of Harry Saddler’s essays, drawn from his blog, Noticing Animals. 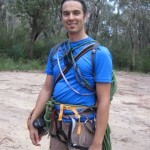 Saddler is a Canberra-born blogger, author and – disclaimer – one of my oldest friends, though we have lost touch in recent years (our parents were friends and we grew up together). I had been completely unaware of his blog until my parents handed me this book, which won the 2014 Melbourne Writers Festival Blurb Inc Blog-to-Book challenge. At its core the book is about reversing a common human trait: ‘So many people are shockingly unobservant of the world around them,’ he writes. For Saddler, this world is an ecological one but one equally replete with natural and human history. The price of this careless myopia is evident in the unprecedented extinction rates and impending environmental catastrophe in the world around us (another book I’m reading at the moment is Elizabeth Kolbert’s The Sixth Extinction: An Unnatural History). Writing on the blog itself, Saddler modestly names it a collection of ‘amateur reflections on encounters with animals.’ But the thought and attention that has gone into the blog is amateur only in the sense that he is unlikely to make a killing from book sales or advertising (something that I can relate to based on my own experience as a blogger and poet!). Each of the book’s essays is named for a particular species of animal – generally birds – upon which the Saddler focuses (sometimes obliquely). He offers background on the animal and, usually, insight into what makes it wondrous, mysterious or emblematic of some greater philosophical, ecological or ethical issue. Take for example, “The Peregrine Falcon” which channels poet Gerald Manley Hokpin’s awe in the face of the common kestrels: ‘If birds move writers to write, falcons stir special eloquence’. Charting his personal history of peregrine falcon sightings, he captures some of the magic of the fastest animal alive today, balanced with a sidenote on the species’ flirtation with extinction as a result of DDT pesticide’s effect upon its egg shells. The essay is focused writing that frames not only the majesty of these swift-winged killers but also quasi-mystical apparitions in our city environments. It reminded me of the time I came eye-to-eye with a falcon who had perched outside a window of my high-rise office; staring into its round, unblinking eyes is an experience I will never forget and, possibly, never repeat. Many of the book’s essays are short, highly personal accounts of interaction with animals, for example “Rat” where Saddler takes the unusual step of observing a group of young rats as he passes on his daily commute. The rats, he notes, are wild creatures, albeit troublesome ones, touched as much by human hand as as any other. The notable formal exception in the book is the long-form essay “Skylark and Fulmar” which charts the history of Cornwall through the prism of a multi-day walk along the English coast. This is definitely one to read: it is fine ficto-criticism that uses the walk’s narrative to pay homage to the birds that dot the landscape. It also weaves in the alarming human history of this place, which once stored 20 tons of the lethal sarin gas. There is a soft anger and palpable sadness permeating the book. In “Ruddy Turnstone”, this manifests in a casual note about grebes crashing en masse into a Wal Mart car park during migration (they had mistaken it for a lake). In “Woolly Mammoth” he notes the irony of global warming, which ‘in part, led to the extinction of the woolly mammoth’, now exposing their frozen remains in Russia. The total number of animals killed on the 18th of October in Muskingham County, Ohio, was in fact not forty-nine but fifty. Among them were seventeen lions, eighteen Bengal tigers, two grizzly bears, six black bears, two wolves, and one human. And if you can take anything away from Saddler’s book it is this: humans are animals too. We just happen to have evolved amazing brains, brains that can unleash creativity and destruction in equal measure. We are the only animal who has the potential to make history for better or worse. As we sleep-walk our way through the greatest extinction rate in millions of years, even the smallest act of ethical thought can make a difference. Each species that disappears is a family of beings, of fellow travellers on this lonely planet, that took millions of year to find their place alongside us. Saddler’s talent for philosophical focus and observation is a skill that we could all do well to evolve. You can buy a copy of Not Birdwatching via Blurb. Alternatively, you can read individual essays on his blog via some of the links above. Personally, I think the essays work best as a collection and the pleasure of reading a bound object makes the purchase price worthwhile. I turned around and was amazed to see this sacred kingfisher in front of my house in Canterbury, NSW. It’s the first time I’ve seen one in the neighbourhood. The presence of birds like this says something about the health of my area’s local ecosystem. 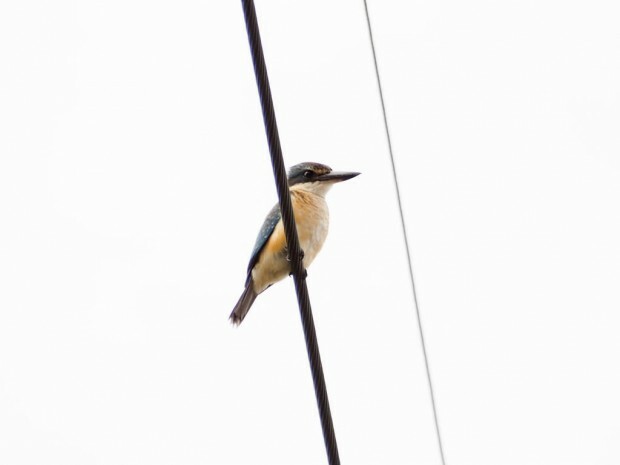 Seeing it on a power line before it darted out over suburbia made my day immeasurably better. A beautifully written review James, made me want to go back and read the book again! Thanks Marilyn. I meant every word I wrote! It was a real pleasure to get to know Harry all over again through his writing and thinking.